People who have perfect – or near perfect – vision might take their eyesight for granted. For those of us who have had to wear corrective optical equipment for practically our whole lives, the story is a totally different thing. I have been wearing glasses since I was in third grade, and if I could afford it, I would have gotten LASIK a long time ago. Glasses can be cool, but they can also be a hassle. Thank goodness for contact lenses. Then again, there is the issue of hygiene and prolonged wear. Contact lenses do offer convenience, but it also means a little more taking care of your eyes. Out of this world? I totally agree, and I do dare to add that the third point is particularly superfluous. Then again, I could be wrong. 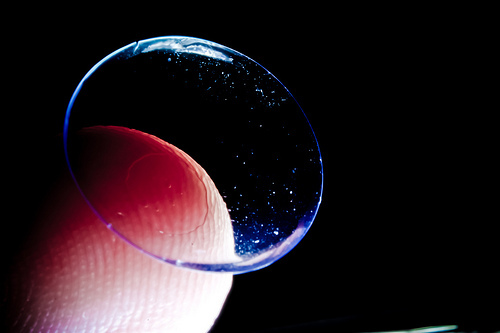 The concept of these high tech computerized contact lenses is called info-vision seems straight out of a science fiction story, and perhaps it is. 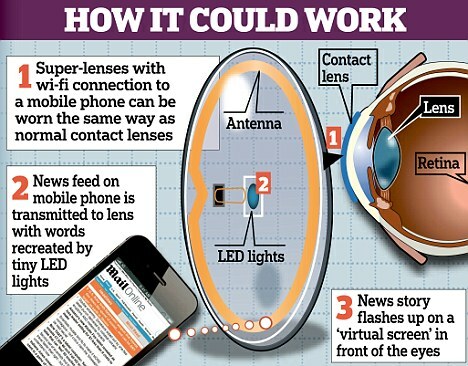 With info-vision, the wearer of the computerized contact lenses will be able to see information right in front of his (or her) eyes. Literally. I think of it as Iron Man‘s vision, albeit minus the visor. You can even zoom in and out to get a clearer view of what is in front of you. Now I can see how this can be handy if you buy the cheapest tickets for a football game. Then you would not have to take binoculars along! Is this concept merely wishful thinking, or is it totally possible? Here’s a little image which shows how it can actually work in real life. Professor Babak Parviz is the guy who came up with a prototype of these computerized contact lenses, and believe it or not, he has actually tried it on a rabbit! His prototype is far from the ultimate lens still, but it seems like he is on the right path. If he is successful, we just might have something totally revolutionary.